"This plague didn't come out of nowhere... It may be some alien race we've never even met before can help us. Or maybe the cure is buried beneath some ancient alien city, forgotten under centuries of sand." After the conclusion of Babylon 5's five-year arc, a followup movie, A Call to Arms set up the next show, with its own five-year story. With a few nods to the Babylon 5 universe, the new series, which sadly lasted only a meagre thirteen episodes before being cancelled by TNT, takes off in its own direction. In 2267 the Earth has been infected with a plague by the Drakh, erstwhile servants of the chaos-loving Shadows. The virus is such that it takes time to adapt to its hosts' systems, giving a window of approximately five years to find a cure. The Excalibur, a gigantic prototype spaceship, is being sent with an uninfected crew to comb the universe to visit new alien races and search alien ruins to find a way to save the planet. 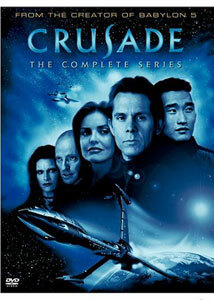 The ship is under the command of captain Matthew Gideon (Gary Cole), along with telepathic first officer Lt. John Matheston (Daniel Dae Kim), xenoarchaeologist/lingust Max Eilerson (David Allen Brooks) and Technomage Galen (Peter Woodward). Also in the crew is alien thief Dureena Nafeel (Carrie Dobro), whose race was otherwise wiped out by the Drakh. Whereas Babylon 5 was largely limited to the space station itself, this series opens up the possibilities as the Excalibur hops from system to system. On the other hand, this has a tendency to start to feel a bit like Star Trek, though with a clearer sense of mission. The production values continue at the same extremely high standards set in the first series, with many of the same crew members carried over. The photography is rather darker than the first series, with its emphasis on shadows and darkness throughout; the series almost feels like a film noir. The CGI occasionally has a video-game appearance to it, but on the whole it's very satisfying and plays well enough even on good-size screens. Once again most of the episodes were written by creator J. Michael Straczynski. He continues with his effective dialogue and story structure, larding the tale with moral dilemmas and making this compelling viewing even in its truncated form. The episodes are presented in the order as originally aired, which doesn't conform to the original production, but the continuity patches on the whole work well enough. One of the best episodes is the last one, directed by Stephen Furst (Vir Cotto from the first series), which manages to get in many suspenseful sequences and gives the series a decent valedictory. Also notable is the hilarious X-Files parody episode, The Visitors from Down the Street, which has fun with the paranoia of that series and its complex tales of political manipulation. Gary Cole takes a while to warm up to as captain, with less of the accessibility of Jeffrey Sinclair or John Sheridan from the earlier series. Daniel Dae Kim is excellent in support, with a tormented edge to his character due to the aftereffects of the telepath wars between the two series. He displays a sense of awareness of his position as a representative for the redemption of his race. David Allen Brooks occasionally takes his corporatist archaeologist over the top with this greed and profit motivations. Although Tracy Scoggins gets second billing throughout the show, she only appears in three of the thirteen episodes. Her character, Captain Elizabeth Lochley, gets some much-needed development through her brief romance with Gideon. Peter Woodward makes a big impression as the smug Technomage, but Straczynski cleverly keeps him out of the picture half the time, lest he dominate the entire series and turn into a one-man deus ex machina. It's hard to judge a series with large planned arcs halfway into the first season; if Babylon 5 had been truncated in the middle of its first season, only the barest glimpses of the overall story would have been seen by then. As far as it goes, the program is entertaining, though it already shows signs of repetition; in particular the episodes Racing the Night and Memory of War both involve going to a seemingly-dead planet that holds unseen menaces. Since it's an incomplete story, there's an obvious feeling of incompleteness, but given that it's been off the air five years a conclusion to the story is pretty unlikely at this point. But at least we have this vision of what might have been. Image Transfer Review: For some reason the widescreen format of the first series is eschewed this time round, resorting to an ordinary full-frame picture. It's quite dark, intentionally, but shadow detail is reasonably good and not overly plugged up. Color, when present, is excellent. Aliasing is common in the CGI segments, but seldom an issue in the live-action sequences. Black levels are excellent. Detail is average, with some good texture displays. Edge enhancement is not noticeable. Some skintones have an odd corduroy artifacting to them, but this tends to appear only in sequences involving opticals or CGI, so it may be an artifact in the original programming rather than a transfer problem. Audio Transfer Review: The 5.1 remix of the original Dolby Surround tracks is not overwhelming, but the explosions and space battles have good deep bass and there's nice directionality, especially from the surrounds. Hiss and noise, appropriately enough, are nonexistent. Extras Review: The extras are a bit more limited than on the Babylon 5 DVD sets. By far the most valuable extra is the commentary from Straczynski on the ninth episode, Racing the Night, which was originally intended to serve as the pilot episode. In this commentary he not only discusses the inception of the series, but where the story arcs, in particular that relating to the mysterious Apocalypse Box, would be going. Although it's not a detailed outline of the future stories, it gives the clear impression that we're missing quite a few surprises. One would have liked to have him speak on another episode and spill more secrets. A more chatty and genial group of cast and crew assembles on the other commentary, which is average in quality. The final disc includes a 14m:27s featurette on the making of the series, with some of the directors and Straczynski chatting about it and the issues with continuity being disrupted by the rearrangement of episodes. A final featurette on the design of the Excalibur runs 5m:42s and includes a variety of drawings and concepts that went into the evolution of the ship. Interesting for those intrigued by production design. The last chapter, so far, in the Babylon 5 saga, sadly cut short before it could begin to fulfill its promise. The commentary by Straczynski is a "must-listen" for fans of the series.